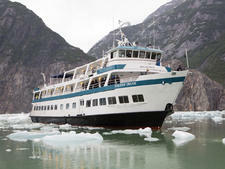 Alaskan Dream Cruises' first ship, Alaskan Dream, is a streamlined catamaran once owned by Glacier Bay and Majestic America cruise lines (under the name Executive Explorer). Refurbished and relaunched for overnights in 2011, the vessel is perfectly positioned for optimal wildlife viewing, with extra-large windows in its cabins and public areas, plus an observation area that encompasses the entire top deck. The four classes of cabins range in size from 104 square feet to 416 square feet (the Owners Suite), but they feel roomier, due to the bed-to-ceiling windows. Several cabins support triple occupancy, and one cabin fits four people in bunks. All rooms have doors to inside hallways, offering more privacy than the typical expedition ship cabins that look out onto an exterior passageway. The toilet and shower are in the same small bathroom, separated by a plastic curtain, while a sink and medicine cabinet stand alone inside the main cabin. Toiletries include Alaska-crafted soaps and shampoos. There is no Wi-Fi, television or telephone; cell service can be restricted, especially outside the larger ports. The main dining room, known as the Sitka Rose, features made-to-order meals, with open seating at six-tops. Social hour, drinks and daily recaps from expedition leaders are held in the Vista View lounge, which serves as the ship's primary gathering spot. As with all of the line's ships, Alaskan Dream has an open bridge policy. 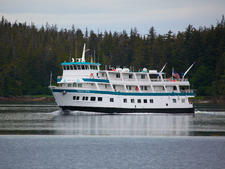 As with all of this cruise line's itineraries, a cruise on Alaskan Dream includes a stop at Hobart Bay, native-owned land where other cruise lines can't dock. The company uses this stop as a "play day," giving passengers the opportunity to kayak, drive Zegos (small jet boats) and RTV's over logging roads. Most cruises also include a stop at Orca Lodge, an island outside Juneau owned by Allen Marine (Alaskan Dream's parent company); it's used as a base for an evening king crab feast, where you can eat as much seafood as you want and cook s'mores over a campfire. 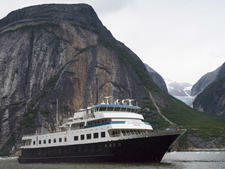 The ship uses motorized skiffs to give passengers a closer look at glaciers, fjords and wildlife on shore. Itineraries that include Glacier Bay feature onboard narration from a National Park Service ranger and a full day of viewing the park's glaciers and wildlife from the ship.